I've only done one run so far as my "canon" run and I just had to pick Olivia and her love of astronomy. Bonus points for having Alice the Skywing and Craig the Nebula as part of the story too! I just bought a market CB Gold today, making it only my second one. My first? Well call me unlucky but it was from 2008! My next goal is to save up for silvers, as I own none of those as CB. I was finally able to breed the fifth xenowyrm species from this pair, a lovely Gaia. Now all that's left is an Astrapi to finish up the full set. It's taken almost two years, let's hope it doesn't take much longer! Yeah, I'm seeing the cave down as well. I was in the middle of editing my snow fort so I thought it was related to the game but I guess it's more people! I just found that my item placement was reverted back to an earlier point from today. Items like the stone castle walls/towers and the chess kings I bought a couple hours ago are now gone, and instead my resources went back up as if they were never bought. I'm currently at level 50 if that helps. Just got an awesome halloween release from Jupiter! Has anyone ever seen their shard counter not add up properly? I started today at 2290 and caught/bred a few eggs, but then my counter stopped at 2299 instead of 2300. Meanwhile it also says I hit my 100 shard limit. I'm super certain I've been hitting the limit each week so I thought this was kinda strange. I'm not seeing Copper eggs in the market but I can choose them in the trading hub. Is that intended? Naming form! 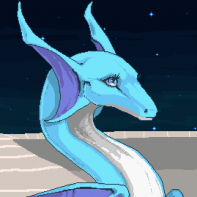 Lineage Name: Virtuous Breeder's Name: helix9 Dragon's Name: Virtuous Snow Flurries Lineage Link: https://dragcave.net/lineage/Tzk2Y I'm still locked by the new releases, but if someone is open to take an egg once I breed her, PM me! Absolutely phenomenal sprite updates. The red especially is some inspired work! I'm coming up to the tenth year that I've been on this site and I'm so glad to see it keep growing. I went on my scroll before seeing the news, and my new release Freckle dragons are up at the top, which I hadn't seen grow up yet. I thought that it was green alts! But then I realized my whole front page was green too. What can I say, yall fooled me! Finally got a yellow undine to hatch after tons of breeding. It was second-to-last on my list of ungendered hatchlings I've been freezing, and the very last one I need is a summer seasonal. I'm glad to almost be done with this scroll goal! Maybe I'll even try to play the alt black lottery again. A second xeno in a row?? And one of the ones I needed too! Now I just need an Astrapi and a Gaia to finish the set of six from this pair. I'd be glad to put some simple images together. I'll put them in an imgur album and send them once I finish. ETA: It wasn't until doing these did I realize that, besides the Pumpkin/Pygmy lines that were the same because they were the only type of pygmies at the time, we also doubled up on Embers too! They get to have two Halloween lines, the Deadly and Malevolent. Whoops? Spoiler tags? We have those now! Alright guys!! Hope you had some fun holidays! I started up with the spreadsheet, and it's a biggie but I'll get it done as soon as I can. While I'm doing that, I would love someone to jump at the naming and voting process for new lines! Here are the holiday dragons that don't have lineages yet: Christmas 2007 - Holly (!) Christmas 2016 - Snow Dragon Christmas 2017 - Garland Dragon Valentine's 2017 - Soulstone Dragon Valentine's 2018 - Floral-Crowned Dragon Halloween 2017 - Omen Wyrm I think the goal is to choose one mate for the Christmas and Valentine's lines, and then two mates for the Halloweens (one male, one female). Who's got ideas? If you have a chance to get only one CB hybred or CB alt, What kind of breed would you choose? Gosh, it would be difficult to not ask for a Risensong and Setsong pair. There's no way I could only pick one! In that case I would have to go with the OG hybrid, the Two-finned Bluna, thanks to their heritage from the lovely Skywing.